A green hay colour, sweet and herbal flavour: these are the distinctive features of the Altamura lentils, called giants due to their typical size, which makes them uniquely different from all the others. These legumes are in fact a local variety of the Alta Murgia region, cultivated with traditional methods and representing an important part of the Mediterranean diet. Ingredients lentils. For more information on product labels, please contact our Customer Service department. The information on the labels of the products may vary for reasons beyond our control, therefore, there may be discrepancies between the information on the site and that on the products delivered. Please always check the information on the product before consumption or use. The Lorusso farm is located in the area of Spinazzola, near Garagnone and represents the history of a long tradition. 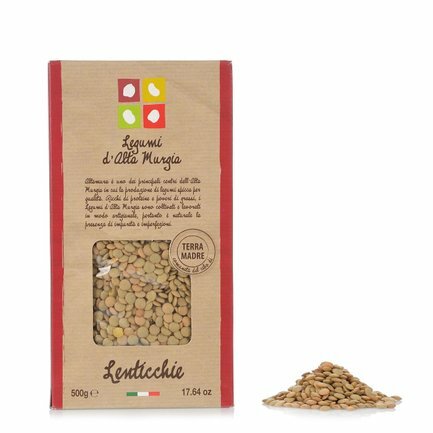 Luigi Lorusso restarted the cultivation of this so-called giant lentil from Altamura, which is distinguished by its soft green colour and by its size, and that was disappearing in the 70's.